Sometimes articulated as Mysophobia (Germophobia), a germ phobia characterises a disproportionate emotional arousal in response to a thought associated with contamination through contact with germs (whether real or imagined). Germophobia is often thought to arise in some instances of Obsessive Compulsive Disorder (OCD) however it’s possible to also have germophobia and not have OCD (or to have obsessive traits without full blown OCD). A germ phobia (however occurring) can be time consuming (for example people might spend hours cleaning themselves) and restrict enjoyment of life at best, and be highly debilitating at worst. Reported restrictions in social and intimate relationships and career progression are common complaints, because the constitution of living around the perceived risk of contamination dominates the life of someone with germophobia. Is there such a thing as ebola phobia? Perhaps a public backdrop to recent media coverage about the ebola virus and its possible risks was its reference in a 1995 Dustin Hoffman movie “Outbreak”, where a town became infected with the deadly disease. The movie implied ebola brings a massive infection risk because in the film, the virus could be transmitted through the air we breathe, where scenes of people coughing on planes or cinemas were common. Some people suffering from Germophobia may well be at risk of developing an ebola phobia, especially those working in medical fields where contact is unlikely yet not completely out of the question (certain nurses, doctors or researchers). Mainstream methodologies include pharmaceutical medication, Cognitive behaviour therapy (CBT), Mindfulness meditation, exposure treatment. Less mainstream methods include hypnotherapy on one end of the spectrum and on the other, psychoanalytic psychotherapy which is less behaviourally oriented and more focussed on the past and how the individual has constituted themselves around germs accordingly. While it’s been challenging to locate research particular to germophobia, in the USA, specific phobias impact 8.7% of adults while OCD, which is often founded in contamination fears, occurs in 1.0% of adults. In Australia, the lifetime prevalence for ocd in adults is 2.0%. What sort of relationship problems or themes have you observed with people afflicted by germophobia? Germophobia is often an aspect of OCD. Patients who have issues with this frequently are anxious about perceived forms of potential contamination. They perform repetitive rituals like hand washing many times and checking behavious like are all windows and doors locked. The partners are regularly frustrated and impatient with checking and cleansing rituals. These take time and usually delays other activities around the home or getting out of the house. Intimacy of various kinds is regularly avoided/ disrupted. Couples go to bed separately, for example while one takes time to complete ritual behaviours. Decision making, for example, purchase of a phone or car seems to take endless time. As so many options are studied over and over for safety and cleanliness. Thinking is often irrational, and hard for the “well” partner to tolerate. The partner with the condition often feels misunderstood and inadequate. Sexual intimacy is often a challenge due to anxiety and fears of contamination. Often a patient with this condition, is also depressed and less available for the partner and family. Given all the Ebola media coverage at present, is it possible some people with germophobia may be susceptible to developing something like an Ebola phobia, and what, if any effects, might an Ebola phobia have on intimate relationships? 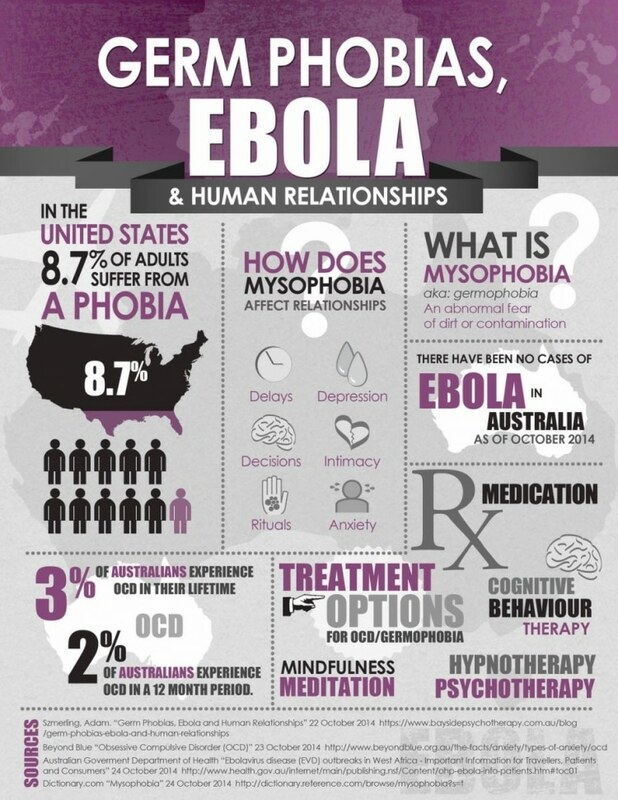 A patient with Germaphobia could add anxiety about the Ebola virus to the list of potential contaminants. The impact on a relationship would be as above and possible increase in over protective behaviours. This would increase tensions in the relationship and children. What brief advice would you give to people with germophobia or an Ebola phobia who wish to curtail some of the effects of their phobia from ‘contaminating’ their relationship? Get counselling to manage anxiety and fear. These conditions do severely contaminate the health of a relationship and are very unlikely to improve without therapy or counselling.